The Book Arts Program offers learning opportunities to the broader community through its K–12 outreach programs, educator-oriented workshops, and studio access for qualified users. 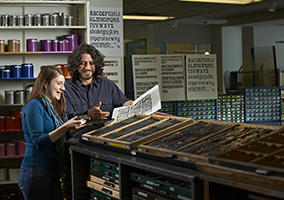 Additionally, the Program offers an annual series of short format (one-half day to multiple week) workshops, in which invited guest instructors as well as Book Arts Program faculty and staff teach processes related to the art of the book, including but not limited to fine and historical binding techniques, letterpress printing with metal type as well as alternative matrices, printmaking, papermaking and decoration techniques, book repair, calligraphy, use of alternative materials, and photography. Invited instructors are nationally and internationally recognized artists and educators who bring a diversity of perspective and breadth of experience to the local community. Workshops are open to the community at large, and class sizes are typically limited to fifteen participants. The Book Arts Program mails out an annual calendar listing upcoming workshops, classes, and lectures. If you would like to receive an annual calendar of events, please join our mailing list by sending your mailing address to bookartsprogram@utah.edu. Click here to be added to the Program's email list for occasional reminders of upcoming events.